Although I consider myself a nail artist, I admit, I don't always have the time to create intricate, hand-painted nail designs. 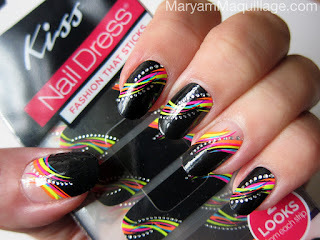 During the busy holiday season, I rely on nail stickers, polish appliqués, and nail art strips, such as this Kiss Nail Dress French or Full set in Eyelet. This double-sided set is one of my favorites and can go on as a full strip or a french tip strip, depending on which side you choose. This feature provides twice the options and is great for adding a few accent nails to your mani. Application and Wear: The strips apply easily without any major bubbling or peeling and are said to last up to 10 days. I'm on day 3 -- so far so good! Contains: Each set comes with 22 dual-end strips. Availability: Kiss Nail Dress French or Full Strips are available at CVS, Walgreens and Kmart, retailing for about $7 per set. Inspired by the Eyelet design of Kiss Nail Dress, I decided to create a matching dress for my Eye :) Here's what I came up with! I've featured Schiap in countless blog posts and it just never gets old. 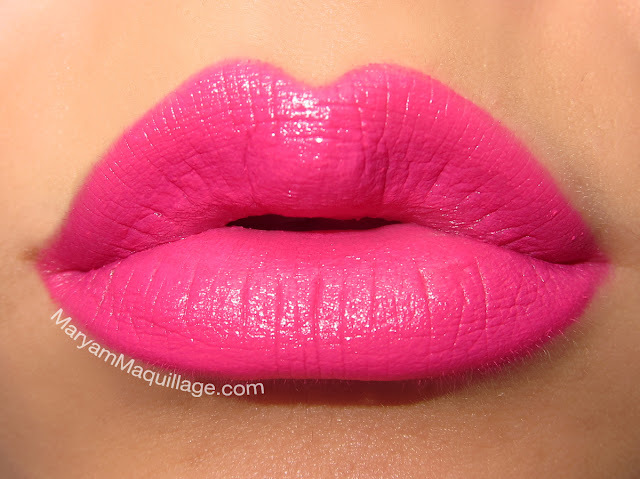 This hot pink looks great on everyone -- this I promise you -- and is a must-have for every makeup junkie! I love love love it so so so much! You are superbly talented! Wow you are an amazing artist so stylish! WOW AMAZING! I love the eyes and I love the nails!!! you are wonderful my friend! sin palabras! Pasate por mi blog guapa un besote! Wow that makeup look is incredible! :) I'm very impressed! I shared it on facebook with your link. Really amazing! I love the bright coloured lips! Amazing! I'll never get over how you get your lines so clean! Magnificent! You did an excellent job! This makeup is IN-CREDIBLE! 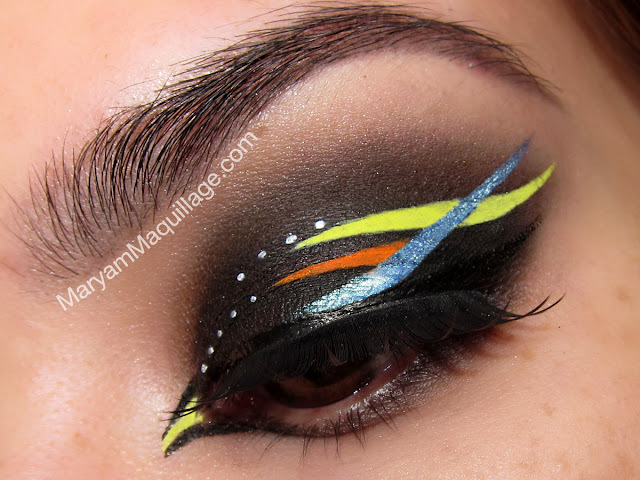 The colours on the eye are so sharp and clean, and the lips are perfect with it! As usual, I'm in love! OMG I'm loving that look!!!! It's so colorful and creative and as ALWAYS polished as ever! I love your work. So fab hun, u r super talented! Remember that day when you and cassie met me and you both had schiap on. Hilarious! oh my! I can't understand how it's possible to do such makeup! very well done! That lipstick looks gorgeous on you! 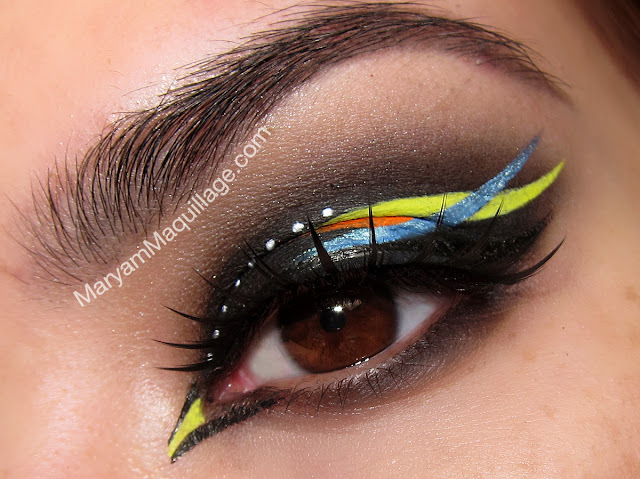 I might have to go check it out :) You are so artistic Maryam, love reading your posts! 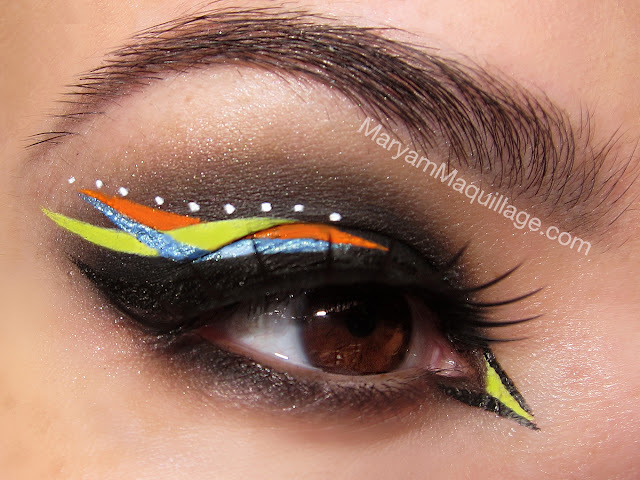 Beautiful graphic eye makeup, thanks for sharing. This is my favourite look that you've ever done!! Such creative eyeliner!!! LOVE!!!!!! This is one of the coolest looks I've ever laid my eyes on! You're such a great artist and I always get so much inspiration from you! Hope you'll have an amazing NYE!